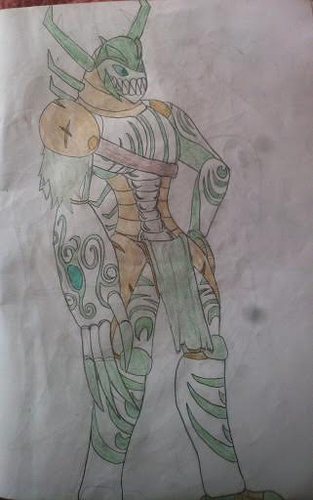 Teridax has a simple past, he was the son of the previous king, and he became king when his father died. 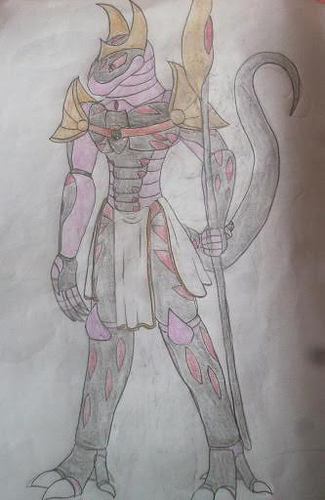 Teridax is a friendly and honest leader on the surface, but what they do not see is his egoism and his manipulativeness, but he is reasonable and does think for the good of his people. Only a while ago he began to behave a bit differently, he became less sociable and some servants, even heard him talk with someone who wasn't even there. Like Roodaka, He's a lightning vortixx and uses his power to manipulate the lightning, shot lightning, etc. But what is strange is that He produces red lightning. This electricity is much more chaotic and can be used to manipulate metals. This red electricity appeared when Teridax took the staff Karzahni. In hand-to-hand combat he's weak , only knowing basic combat skills. The Twin Staffs of Karzahna are an object that has 2 mental crystals that are connected directly to Karzakhna. The two people who have this Staff are Teridax and Vezon. Zakaz is Skakdi village. It is located between the great mountain of chaos and the cavernous forest. The buildings are built of stone, bone, steel, leather and wood, but most of the time you will see tents. The inhabitants of the five clans live in the village. The Malachite Clan, led by Zaktan, the Obsidian clan, led by Hakann, the Dravit clan, led by Avak and Reidak, the Howlite clan, led by Thok and the Tanzanite clan, led by Vezok. -The Malachite clan takes care of hunting and scouting. -The Obsidian clan takes care of guarding, training warriors and gladiatorial fighting in the arena. 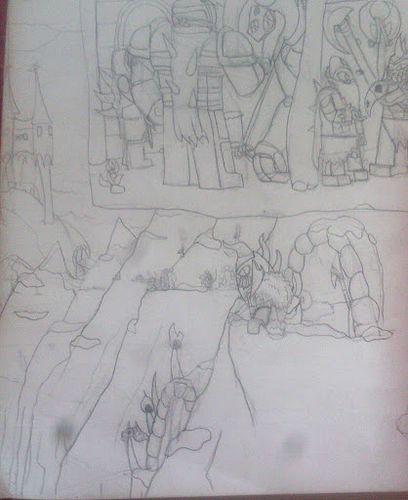 -The Dravit clan takes care of, timber harvesting, healthcare, construction, and making weapons and armor. -The Howlite clan is responsible for archiving, storage and defense. -The Tanzanite clan takes care of fishing, defending against attacks from the sea, and has been selected to lead other clans. Zaktan was a very fast learner in her youth. And quickly, she became one of the best hunters. When the former leader died, she was chosen by the clan to become the new clan leader. Zaktan is very smart, cunning, patient and vicious. She enjoys hunting, to her there is no greater pleasure than hunting her prey and then killing it. She finds to kill her prey without hunting it, very boring. She is also known for her short temper, if anybody opposes her back. She is known to break their arms or legs. For her abilities, she has immunity to the air element and great physical strength, and due to the Gauntlet of Storms, she has strong control over the air. With the Gauntlet of the storm, she learned to convert her body into a thick green gas to fly or to go through small holes, cracks, grids, etc. But although She has immunity against the air element, She has no resistance to other elements. For weapons, he uses a hunting dagger and the Gauntlet of Storms. The Gauntlet can change it's shape into a fan that produces powerful air strikes and small tornadoes and falcon-shaped claws that produce spheres of compacted air that can be fired at her enemies. But the Gauntlet has a limit on how much elemental energy it can be stored, and if you use it too much, the Gauntlet will change back into its usual form and she will lose many of her elemental abilities, When fighting against someone, she always avoid their attacks and hit them with their hands or with her hunting knife into their weak spots. She uses the Gauntlet only against large clusters and those who survive; she quickly kills them individually. Karzahni used the Matoran form as a template for the Vortixx and the Skakdi. And then added characteristics (abilities, physical characteristics, etc.) from other creatures and former experiments to make them. Even as a child, he was problematic and has repeatedly made trouble. Hakann was disciplined by the Leader of the Obsidian clan and eventually started to hated him. But, over time, he became a very powerful warrior and became acquainted with Vezok. He repeatedly challenged the Leader of the Obsidian clan on a duel, and he lost each time. When Vezok became the leader of The Tanzanite clan, he gave him a bottle of green liquid, Which Vezon was found once on the beach. Hakann immediately drank a bottle before Vezok had the opportunity to tell him not to do it. The fluid increased muscle mass, thickness of arm and size. A year later, he challenged the Leader of the Obsidian clan to Rakas, the duel to the death, for the leadership of the clan. Hakan won this fight and showed what happened to those who wanted to challenge him. He ripped the now former Leader into two. Hakann is very aggressive, impatient, egoistic and as one of the clan leaders is not too smart. he likes to fight and prove his power. He will often compete in doubles of power with Reidak, Which has become very popular events. As Skakdi he is immune to his element (this is the fire in his case), and he has great physical strength. Because of the Vulcan Gauntlet, his elemental abilities are increasing. The mutation increased his strength, armor, and gave him the ability to launch himself into an enemy like a rocket. Otherwise, he has no immunity against other elements, the Volcanic Gauntlet has a limit on how much elemental energy it has stored in one time (like with Zaktan). For weapons, he has the Vulcan Gauntlet and his fists. The Volcanic Gauntlet has only two forms, the standard form and a Lava claw that can shoot lava spheres. In battle, he is the definition of brutal, striking, crushing burning, and destroying his enemies with heavy blows and kicks. This is amaizing, I feel really bad this thread did not recieve as much attention as it should have. I would advice doing something similar to the Barraki pitch of mine, constantly update the first post so people don't have to scroll through all the replies, add a TL;DR, make interesting parts for every character, add strong text, that is important and helps navigation a lot more, yeah..
Clear it into different parts so people can orient well and know what part of the pitch is about what, make the first post feel detailed and interesting. I have to say that you inspired me a great bit for the barraki! You're a really good artist! But I feel like you could use a program like Gimp or Photoshop to port your hand-drawn pictures to digital version and outline them in the program, spice the colors up a bit more. It can make them look more 'professional' and interesting. Thanks for all the help. I'm thinking of changing the first post. But I would ask something. That's what I've been thinking since I looked at Other Smaller Islands. That would change some stuff in my story. Karzahni's island is the island where He was isolated. After Karzahni was defeated, he was locked in Mahri-Nui. But he had a contingency plan if his brothers had stopped his plan. Which would be activated if Karzahni disappears in order to fulfill his work. This contingency plan is a creature called The All Seeing Tree, which was made from his Essence (and other things). The All Seeing Tree is the creature who made the Vortixx, the Skakdi, and is trying to complete his "solution"(Plan). 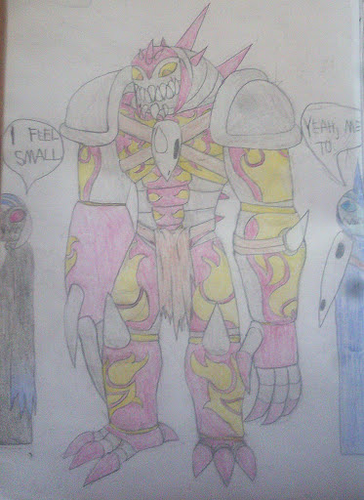 Through time, the creature began to think that it was Karzahni himself. Still needs polishing. But I wonder what you think. And I've already downloaded Gimp. It'll take some time to get used to it. That is truly a creative solution and a nice idea! You should include that in the redone first post! As for gimp, if you need anything, just pm me, I'll try to help, although I am not a complete expert. New information about Reidak and a new picture of Zaktan was added first post here. I love your Zaktan also love Skull Scorpio! Thank you, But i'm actually planning on changing the pitch. -And a clothing redesign for Roodaka and the King of the Vortixx, to make them loock more regal. Actually, would the dark hunter piraka be named by their actual name in the story. Wouldn't the piraka be called by their code name in the story, You know: The Beast, The Snake, The Bully, The Tracer, The Drifter and The Trigger. Also, I'm not going to be calling them piraka in the story because that name doesn't fit what they are in this pitch. 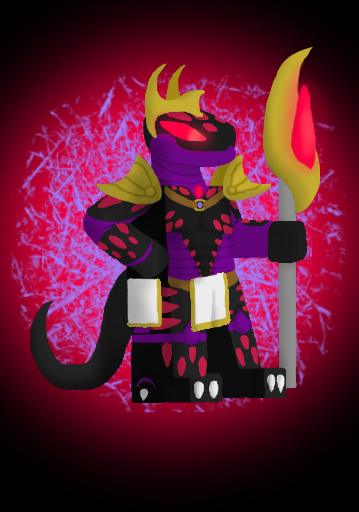 The new design for Teridax, the king of Vortixx HERE.